First thing Wednesday morning we caught the bullet train from Tokyo to Kyoto, where we'd be spending the next three nights. 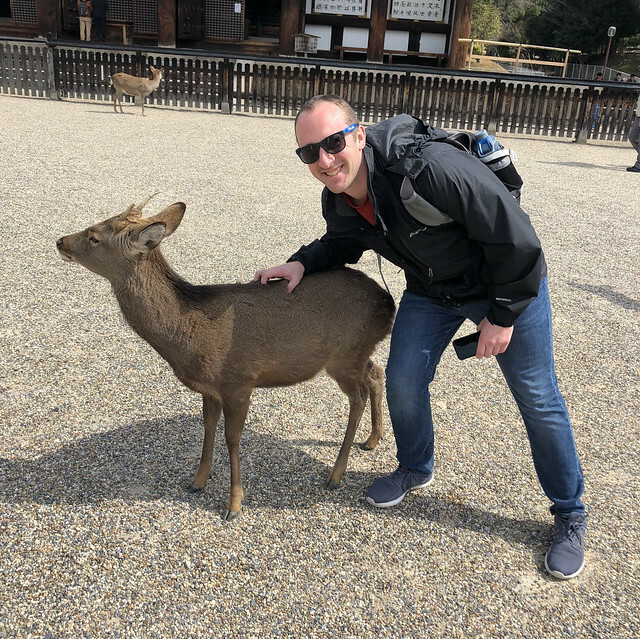 After getting a bit turned about in the massive train station, we found our hotel, dropped our bags and hopped on another train to take us to Nara for the day. 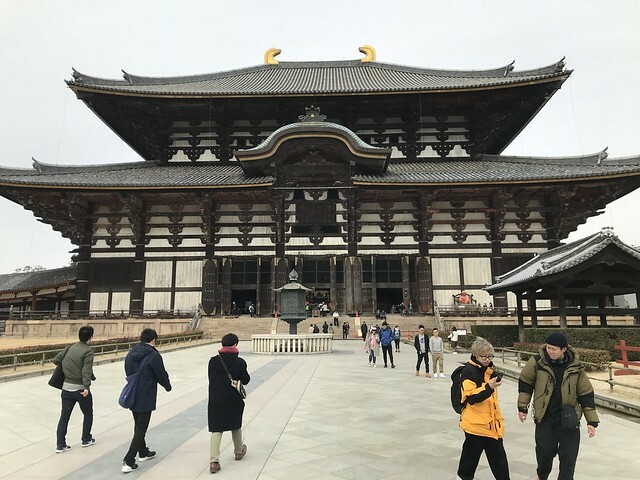 Nara is a bit south of Kyoto and is home to Todaiji Temple -- the largest wooden building in Japan, which houses one of Japan's biggest buddhas. 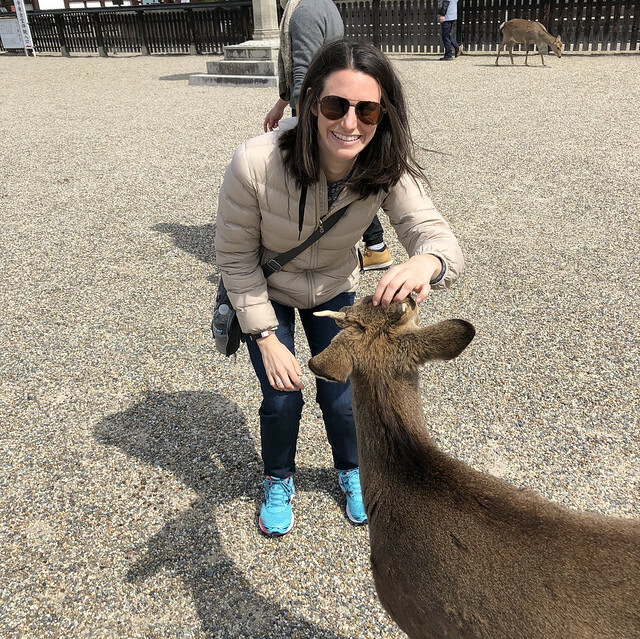 Nara is also famous for its park full of friendly deer that love being fed by tourists. 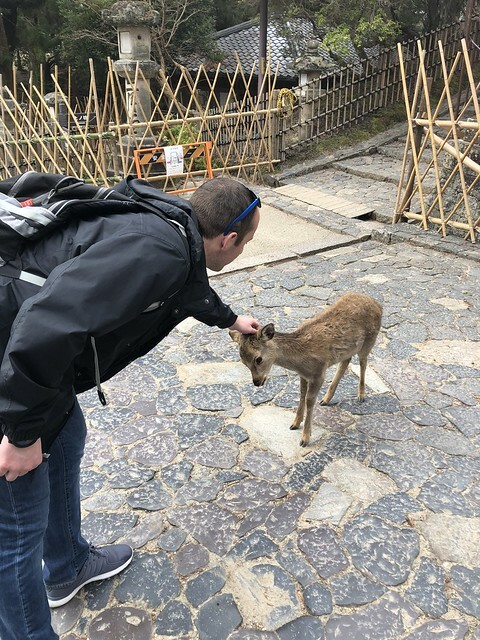 When we got to one of the first temples near the entrance of the park, we immediately saw deer walking up to tourists looking for food and tourists trying to make friends with the deer. 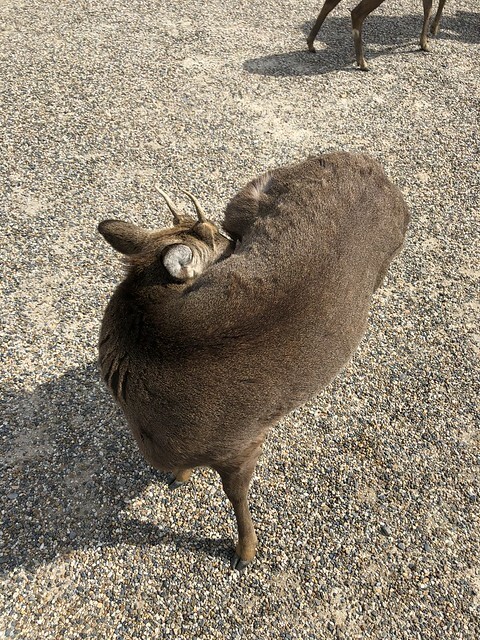 Since Nara is known mainly for the deer and the giant buddha, a lot of tourists just come for those things. 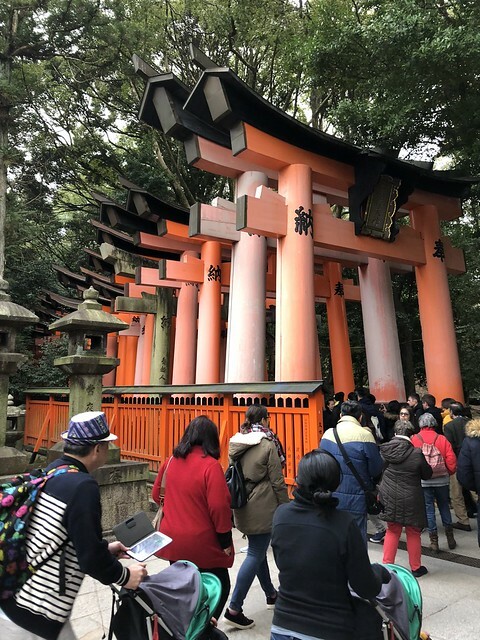 But one of the many travel guides I read before this trip had a cool walking tour of the park outlined, so we decided to follow that and get more of a taste for what there was to see. Our first stop was Yoshiki-en. 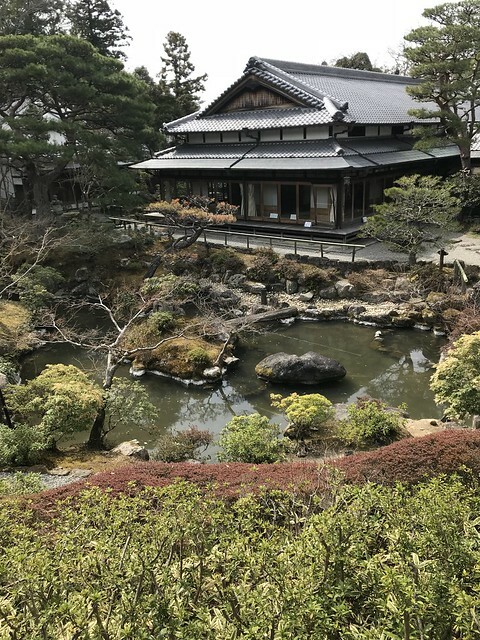 This garden -- which had free admission for international visitors (yay!) -- was really pretty. Even though there wasn't a ton of stuff in full bloom, I loved seeing the teahouse overlooking the water. 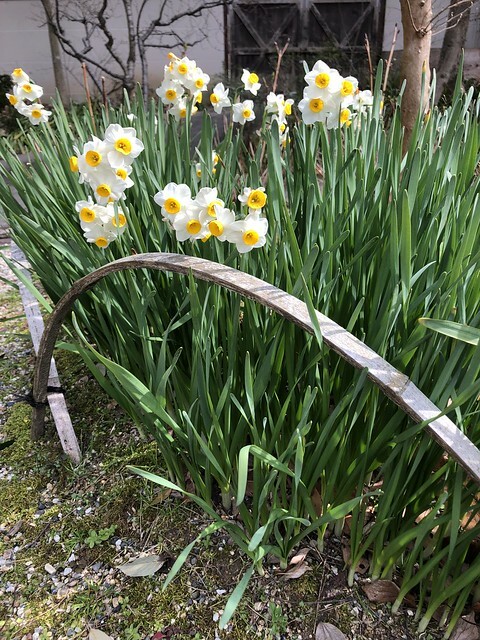 And we got to see a few early daffodils. 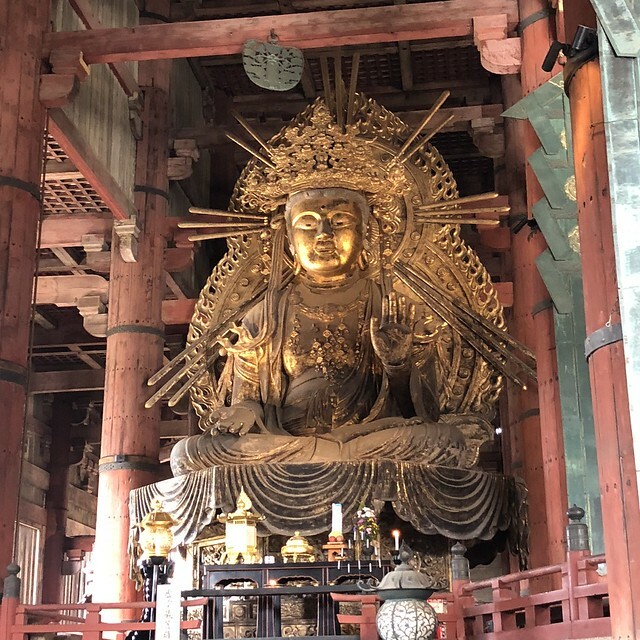 We decided to hit up the Todaiji Temple next. 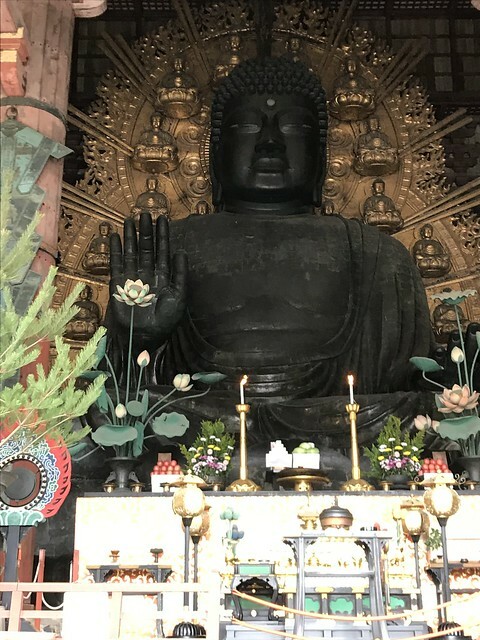 The building that housed the Great Budda was insanely huge. 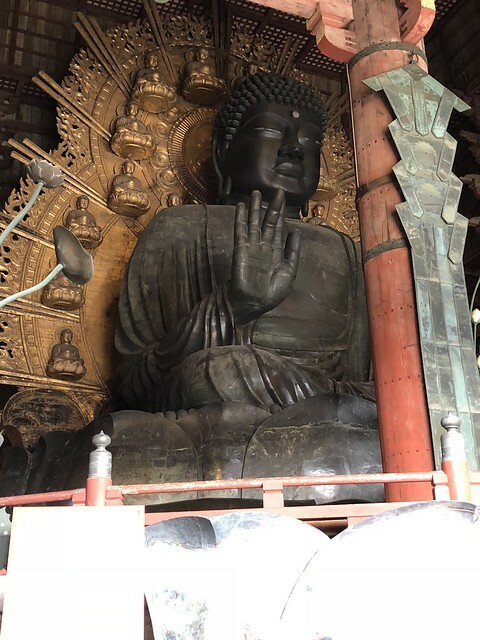 And then when we actually got to see the statue of the buddha itself we were both pretty stunned by just how massive it was. I'm not sure the pictures here can really do it justice. This was by far our favorite thing that we saw on this day, and it's definitely one of the best parts of the entire trip. 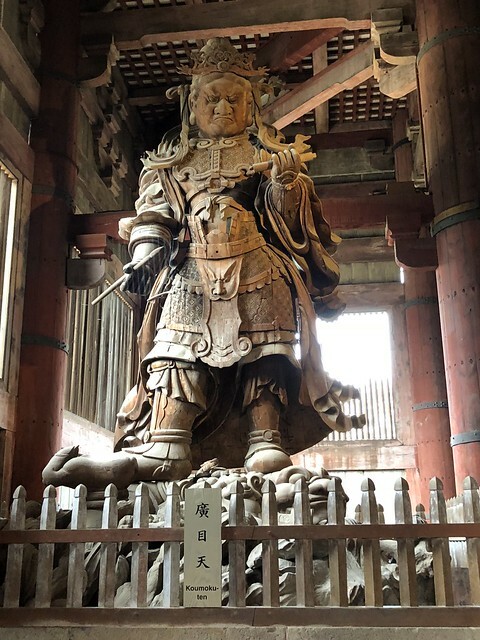 The buddha wasn't the only massive statue in the temple. There were also some boddhivastas and scary looking guard statues. Our walk through the park took us away from a lot of crowds after this point, which was kind of nice. 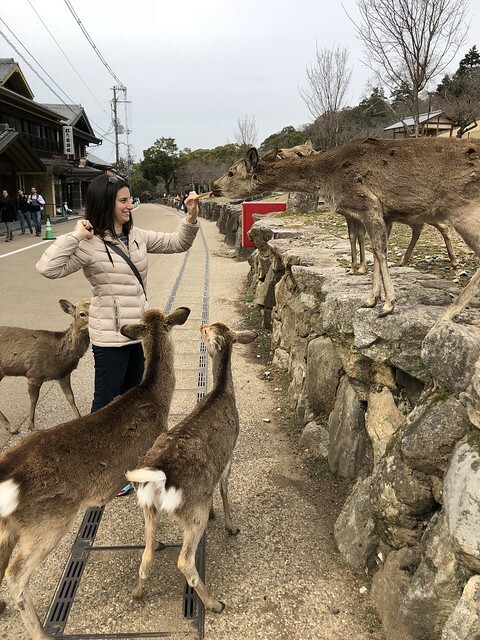 We walked up this long hill that was just lined with deer lounging around, so we decided to stop at one of the shops and pick up some deer food. Oh man did that start a feeding frenzy. All those lazy, lounging deer perked up and came right over to try to get some food. 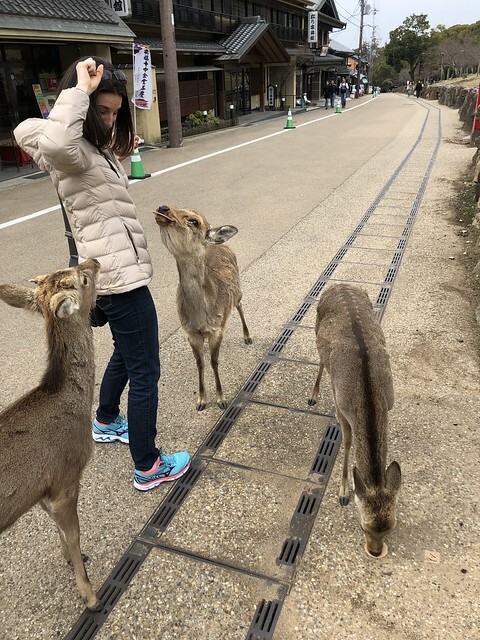 I was taking pictures of them and holding my food behind my back, when all of a sudden one deer snuck up behind me and yanked a bunch of the food out of my hands! He was bold! 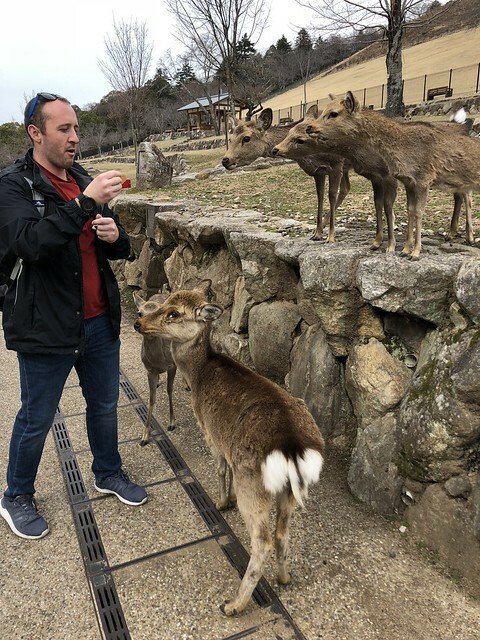 The deer chomped through our food pretty quickly and not long after we were back on our walk enjoying exploring. 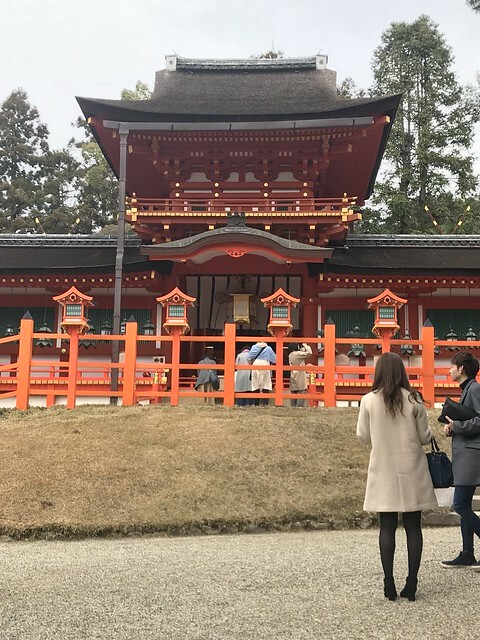 Our last stop in Nara was Kasuga Taisha Shrine. 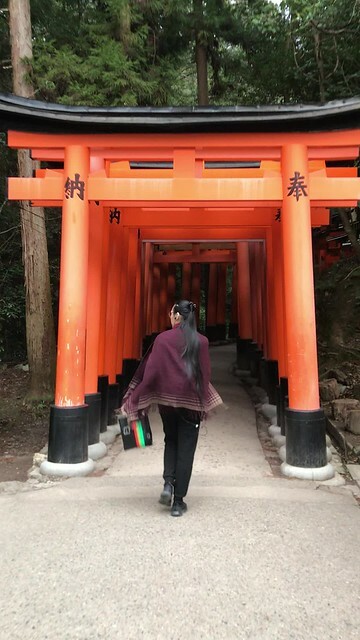 By the time we got to this shrine, we were a little drained. It had been a long day and we debated not going inside. But it was a UNESCO World Heritage site, and we were right there so we felt like we probably should. And I'm really glad we did. 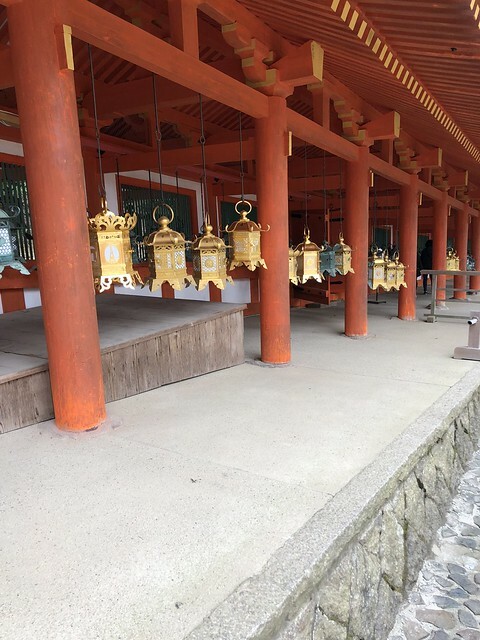 This shrine is lined with thousands of lanterns of all different shapes and sizes. There are festivals during the year when they are all lit up, though we weren't there to witness one. 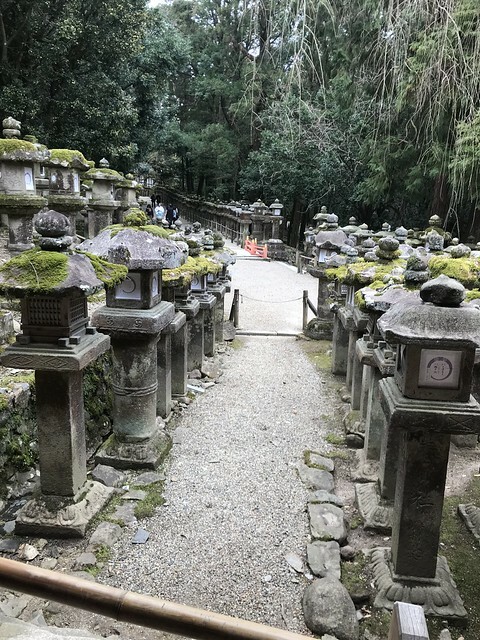 Plus all the paths in the woods leading up to the shrine are lined with lanterns too. It created a very cool atmosphere. The walk from this temple back to town took a while, but it was a nice casual stroll and we were both glad to stuff our faces with a massive (and very late) lunch before getting on the train back to Kyoto. 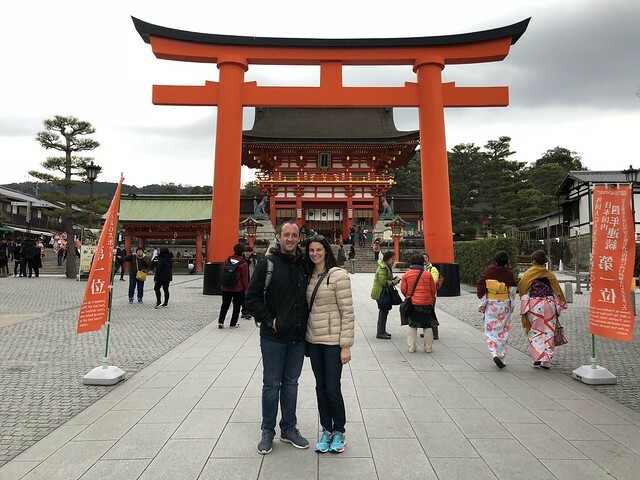 Before heading to our hotel, we decided to make one last stop of the day in Kyoto at Fushimi Inari Shrine best known for its "infinite" torii gates. 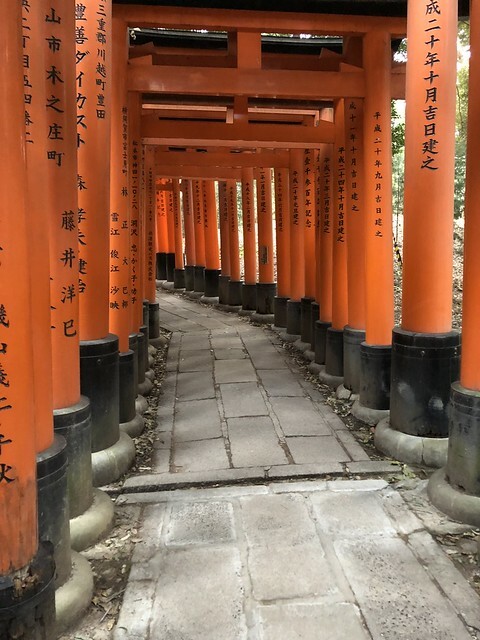 I'd heard this shrine gets packed, so that the best times to visit are early morning or in the evening. Since it was already the evening we figured it was the perfect time to stop. Unfortunately we arrived at the same time as a massive tour group that clearly had the same idea. 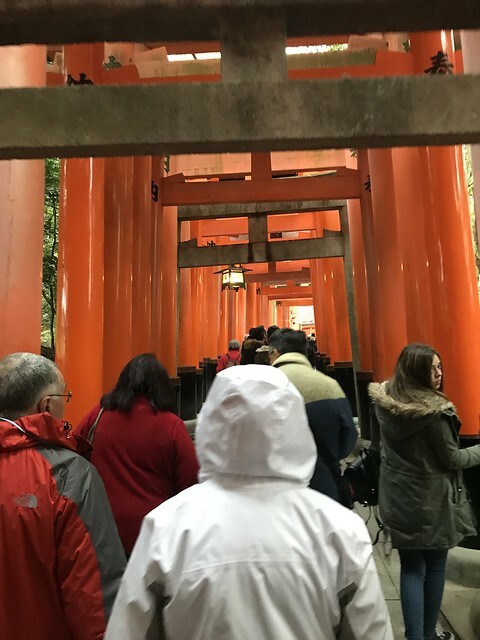 Things were a little tight on the paths through the torii gates until we got past the first rest point and made our way further the up the mountain. Since we were tired and losing daylight, we decided to not attempt hiking all the way to the top of the mountain. 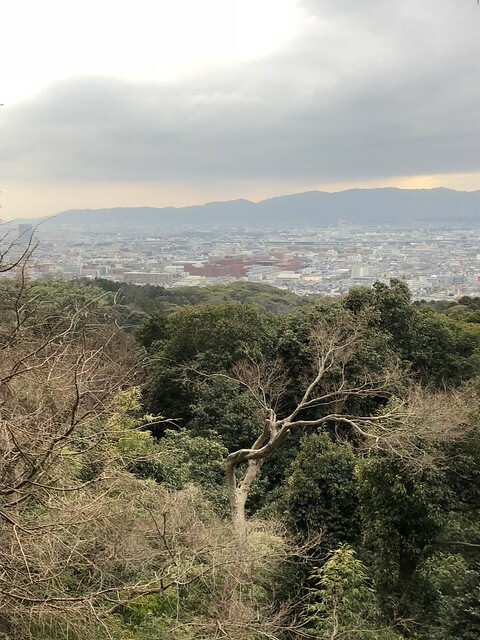 Instead, we made it our goal to make it to one of the main lookout points. The crowds along the paths had thinned considerably by that point and we had pretty easy time the rest of the walk up. 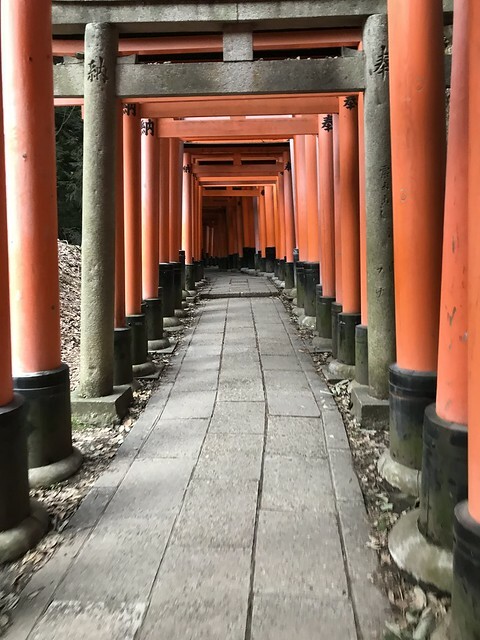 It was cool walking through all the torii gates. Some were massive, some were small. You could tell that some where in much better condition than others. When we made it to the look out point, the views at dusk where rather lovely. After such a full day of travel and walking around, it was kind of nice to get back to our hotel and collapse into bed. Unfortunately that collapse happened around 7 p.m., which means we slept through dinner and straight through til the morning. The jet lag had caught up to us for real.